Daylight Savings is my favorite holiday. The title of my blog post today is not a joke. I have actually responded to the question "what's your favorite holiday" with "Daylight Savings Time." I prefer to justify it with the farming reason rather than the bombing reason, although my personal reason has to do with shaking up my sleeping schedule. But regardless of a clock change (or in the case of my vehicle no clock change) spring is a pretty good reason to like this time of year. yeah. seasons. good enough. This weekend is the Money Talks Art Walks event at Individual Artists of Oklahoma in OKC- I hope you come out to check out all the donated artwork, and take a piece home for yourself! I have donated two pieces for the auction-style game show again this year and we will see what there is on display (they take an open call and display 200 and they received so many!) Purchasing this art will help support the grassroots space and its programming and also, you will be exposed to one of 100+ artists who may never have shown with IAO and is emerging in the state! Check out this great video on how the game-show-style auction works. I have been playing with acrylic gel transfers a lot lately, trying to bring more of my drawing style into my paintings. 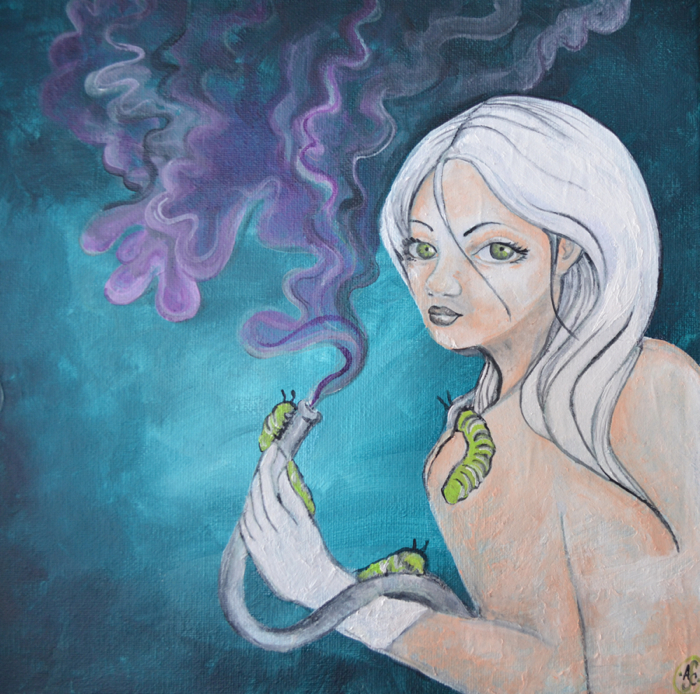 The piece below I finished this morning is based off of a sketch from a previous (and very large) painting I did of a mermaid with a bubble hooka. It was originally an Alice in Wonderland sketch so I kept some of that narrative. It's called "Alice Entertains". She will be for sale as well as available as prints soon. I will talk more on gel transfers soon (there are some great tips out there and I am developing my own methods from the materials I have read)- in the meantime, come out to IAO this weekend and don't forget to set your clocks!